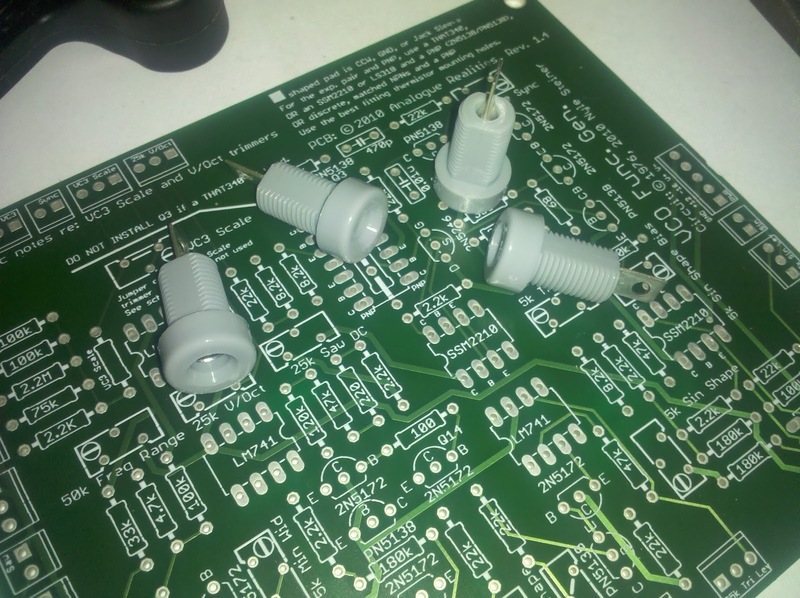 David's panels designs (FPD) are set up for the EuroRack format. I suppose this makes sense, given that it is one of the most popular modular synth formats these days. Plus, the original modules were quite near 3U in height. Generally, I am not a fan of the EuroRack format, but the designs here are far from your typical EuroRack configurations... they're very classic, well-labeled, and don't seem cramped. In addition, they're all multiples of 7hp in width. The only thing that still had me wary was the 3.5mm jacks. I know the original used 'em, and I know some of you love 'em... but to me they feel so flimsy, and I really can't stand them for anything besides headphones. I also didn't want to go with yet another format... my Dotcom system uses 1/4" jacks, and the Best of CGS I plan on building will use banana jacks. So... why not go bananas?! And that is what I decided to do. There's only a few "gotchas" with using bananas in the Synthasystem, due to switching jacks. But, those are really only on the VCA, Sample & Hold, and Envelope Generator. I'll get into this further as I write about these specific modules (and my builds) later. I also updated all of David's FPD files to use banana jacks. There's a number of places in the system that use multed outputs, which aren't really needed for banana jacks, but I decided to keep them since I really liked the designs (and in some cases they give symmetry). There wasn't much I needed to change otherwise - mostly just a few spacing issues. I haven't ordered any panels yet, though... so fingers crossed! !